Follow me to the fish section, sir! 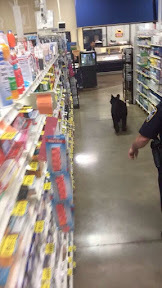 A bear cub wandered off the mountain into town and caused a bit of a stir two days ago when he walked into the local Food City grocery store, thanks to those automatic doors! Poor thang. He was probably just hungry. The story will undoubtedly be above the fold in next Tuesday's local paper. Ha. We have lots of excitement here in our little town. On the home front, the wee ones are enjoying being out of school for the summer and playing in the lake. 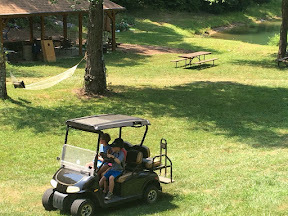 Will is honing his driving skills in my golf cart, hauling around his older bro and his older cousin! Yikes on the bear. He's just shopping. Right? I'm glad you're home safe and sound. It's good to go but it's nice to get home. Glad you got to visit with Bill and Jeanie. Have a wonderful saturday Sandy. See ya.